Properties in Lumbarda average 4.4 out of 5 stars. Historic villa with large gardens near the beach. Property 6: Historic villa with large gardens near the beach. Property 13: Villa "Magical View"
Property 14: Just 10 metres from the sea, Private pool, Sailing Dingy , bikes and Kayaks. NICE VILLA WITH JACUZZI, 300 M FROM BEACH, QUIET LOCATION, FOR 6 PERS. Property 19: NICE VILLA WITH JACUZZI, 300 M FROM BEACH, QUIET LOCATION, FOR 6 PERS. 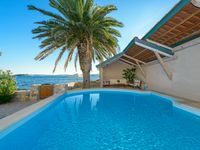 Property 45: A beautiful villa with outdoor pool and panoramic sea views! It is a lovely villa right next to the sea. We had a wonderful time! We had a lovely stay in Lindsey's house, and the 5 stars reflects her efforts in making our stay a great experience. The fridge broke during our stay and she had it replaced within 2 hours - great customer service! She recommended some other great experiences: the boat trip with Goran was a once-in-a-lifetime highlight, what a treat! Her next-door neighbours have a wine store where we tasted their wine, and had a great conversation with the owner about Croatian wines. Also recommended. a &quot;Private&quot; beach is literally across the street - so easy to tell the kids to go to the beach alone, without having to worry about them. Restaurant recommendations were great - we loved the restaurant Karmela and became &quot;locals&quot; within 24 hours, as well as the slightly hidden small restaurant a bit further walk away (I cannot remember the name) which had the most amazing fish I've ever tasted. The house was spacious for our group of 9, everything was neat and clean, and worked well. There were enough living spaces and sitting spaces for all to have their &quot;own space&quot;. The pool is a great plus after a hot day on the beach. Fresh fish at 7 am was great too, and convenient with the grocery store 100 m away. Also great to jog on the front road in the mornings - exactly 5.5 km jog for the Viganj strip. The wind surfing is also a great plus - great spot, all of us had a blast and the holiday was definitely a &quot;bucket list&quot; item. Viganj is super family-friendly without being too busy - we really loved the place overall. It is safe, friendly, quiet without being too quiet, lots of water activities, good restaurants, close beach ... all great.